I just returned from awesome homecoming trip of Miami and West Palm Beach, FL to see my family and friends. While driving around in my rental car, I listened to a lot of radio, and despite my better judgement, I fell in love with Jamie Foxx’ “Blame it on the Alcohol”. Although I hate the idea of blaming (or justifying!) a one night stand on alcohol, the groove of this song cannot be denied. I had the idea of creating parody lyrics, and while googling the original lyrics, I actually found guitar chords for the song. After digging a little deeper, I learned that another guy had an acoustic performance video of Blame it on the Alcohol” on YouTube. This musician is a soulful singer/songwriter named JR Aquino, and he’s from Anchorage, Alaska! I thought that that was pretty cool because while I may never get to Anchorage, I can always get to YouTube, so JR is very smart to leverage the power of the internet. Plus, now I can share him with YOU! Enjoy! If you want to take a stab at this song yourself, you can also find the lyrics and chords here. I’m quite happy about today’s Band Halloween post because I get to multitask: A) I get to feature a Halloween-type musical video, and B) I get to share some music marketing tips! Day 21 of “The 31 Days of Band Halloween” features a video by singer/songwriter Kina Grannis, in which she performs a cover of Rihanna’s latest single “Disturbia”. Kina Grannis has been on my radar since August, and I’ve been waiting for the right time to share, and just in time for “Band Halloween”, she records a verson of Rihanna’s “Disturbia”. In the spirit of full transparency, Kina’s video is not exactly scary, but I will add that there are candles, as well as a “scary” doll featured. But hey, we’re talking band Halloween here, and it’s close enough for me! Kina Grannis is a Web 2.0 musician, without a doubt, and I’ll tell you why. When I took Ed Dale’s Thirty Day Challenge for internet marketing in August, one of the Challenger teams favorited a video of Kina singing a song she wrote called Gotta Digg while we were learning how to bookmark websites. The song was cute, and she even had her sisters singing backup with her. My first thought was how clever (not to mention viral) it was to write a song about an online bookmarking site. My second thought was that I had to find out more about this singer. So glad I checked, because Kina’s Digg song barely scratches the surface of what she is about. Miz Grannis releases a new video each week to YouTube and her blog at KinaGrannis.com. Each video is a song of her own, or a cover, or maybe even a guitar tutorial. At the end of her videos, she talks to her fans, and if she’s received any fan gifts since last week’s video, she’ll give a little “show and tell” at the end, along with personal thank yous. Her idea of combining performing with videoblogging is GENIUS, I must say. Her dedication to the goal of posting a new video each week has been parlayed into an appearance on the Super Bowl, sold-out shows, and even a record deal. Oh, and I cannot forget the dedication she inspires in her tireless street team. Kina’s street team puts in the time for her, and even created a birthday video for Kina (This page also features other birthday dedication videos from Kina’s fans too). On one hand, what she has done with her music career is amazing. On the other hand, it’s not impossible, and can be replicated by other musicians willing to put in the dedication. You can’t buy this kind of fan love. You earn it by showing up regularly and performing. I dare you. Try it! 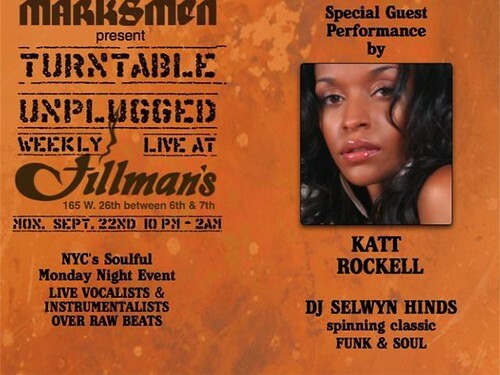 New music artist Katt Rockell will be performing at New York City’s Tillman’s on September 22nd for their Turntable Unplugged. With a commanding stage presence and a voice described by a major label A&R representative as the “sweetest tear,” Katt Rockell draws you into her lair and delivers a knock out punch every time. Fans will walk away mesmerized, invigorated, empowered and most importantly – completely satisfied and wanting more. A stellar vocalist, Katt is preparing to share her musical vision with blazing hot tracks that will make you sing out loud, tap your feet and at times rejoice with tears of joy and victory. Her debut solo project will document a very personal and triumphant journey of rediscovery. Currently, Katt is recording with the production house Truth & Soul and Peter Lord, as well as other high-profile producers and writers. “I’ve been on an incredible path that has helped shape me as an artist, Katt says, “I really want to make an honest record and share all of the bumps and bruises as well as my growth as a singer and songwriter”. 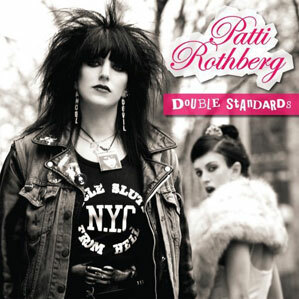 Katt’s music is timeless and her star is rising fast. So, prepare yourself for a smooth and funky ‘diva soul’ journey because there’s a new Katt in town. Check out New Music Artist Katt Rockell at her MySpace page.